Not having a job is the most miserable thing ever. I could probably have a job if I decided to work at Bed, Bath & Beyond again, but I feel like that would be so much worse. I should probably ask for more days of work at my internship. Anyway, without a job, I've still been eating so much, even though I don't know where the money is coming from. I went to Kosta's yesterday, which is one of my most favorite restaurants ever. I could probably eat there everyday and not get sick of it. But if you do ever go there, I would stick with the Greek food items, but then again, who is actually going to order a regular old turkey sandwich at a Greek restaurant? I've already posted a picture of this a long long time ago, but this isn't from the same day. It's the same meal though. It's a gyro and the best greek salad ever. There pile of feta on top creates a little dressing pocket then once you get to that part, it's like dressing lava erupting on your salad mountain. I also didn't get feta cheese on my gyro for the first time ever (they charge $1.50 for it! ), and it was just as good and I didn't even notice. But I still love feta. I was going to get the greek calzone, but they were out of dough. When the waitress told me they couldn't make it, I thought they meant forever and it took me a while to recover from the shock. The only problem with the Gyro Plate is that if you order it from the dinner menu, it costs way more and they don't give you greek salad or fries. I think. 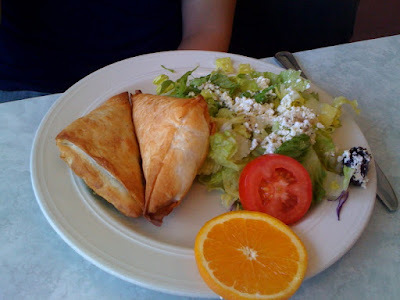 Spanaokpita and tyropita with greek salad. (Note: I spelled both those words correctly on my first try and I didn't even have to google them) It's phyllo dough filled with feta and the other is filled with spinach. I'm not sure which word belongs to which filling. There are lots of things I really hate about living in Mukilteo, but I love Kosta's so much that it's enough to make me forget all those other things. I've been to Aladdins and that one gyro place in Pioneer Square that is supposed to be really good and the meat comes in little chunks not strips, and even though I know there are probably better gyros out there, I like Kosta's the best. tyropita on the right, spanakopita on the left. i just realized that you weren't wondering which one was which in the picture...so to answer your actual question...spanakopita=spinach. tyropita=feta.